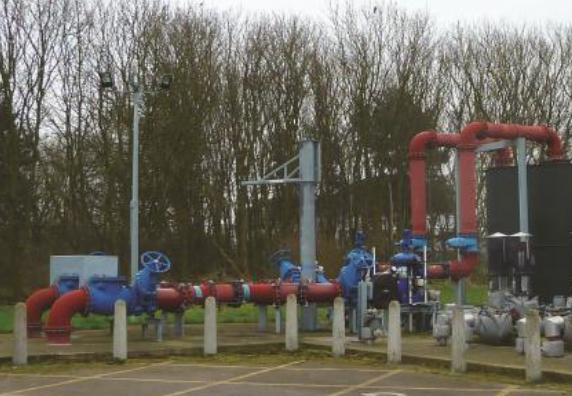 Severn Trent Water has cut the risk of flooding homes with sewage overflow by installing an ABB variable speed drive (VSD) within a pump control system. The new control system is switched on if the primary programmable logic controller (PLC)-based wash water control system fails, avoiding the need to use an emergency tank which only has capacity for eight hours of incoming sewage. The wash water is a critical part of the wastewater treatment process at Severn Trent’s Stoke Bardolph facility near Nottingham. It is used to clean the screens at the inlet works. If no wash water is available, the screens become blocked, the water level in the inlet channel rises and the inlet screw pumps turn off to prevent the screen house from flooding. The six pumps controlling the wash water are usually controlled by a PLC, but this has suffered a number of failures over the last five years caused by the controller’s memory loss, which have led to it going offline. When this happens, no wash water is available to clean the inlet screens. The treatment process stops and sewage arriving at the site, which comes in at a flow rate of up to 4000 litres per second, needs to be stored in an emergency tank until the system can be put back into operation. Dorn was looking for a simple alternative system that avoided the cost of installing and programming a complete standby PLC system that might sit idle for most of the time. The system would need to handle the essentials of the wash water control system, while leaving out some of the less crucial aspects such as control of the wash water filter’s backwash system and duty rotations. Dorn designed a system that would act as a back up to the main PLC while it was out of service. This is based on an ABB machinery drive, ACS355, acting as a PID controller. The drive uses a watchdog relay to monitor pulses from an output on the PLC. When these pulses are not detected, because the PLC has gone offline due to a failure, the drive goes into action. It can also be switched on manually, for example when the PLC-based system is undergoing routine maintenance. The drive controls two wash water feed pumps that pump water into a buffer tank. It monitors the level of water in the buffer tank and starts the pumps when the water level becomes too low. At the same time, it opens an inlet valve into the tank from the pump lines. The pressure of the water leaving the buffer tank is maintained at five bar by four booster pumps. This is important as the buffer tank is sited some 500m from the screen house and the booster pumps ensure that the water is at the correct pressure when it arrives there. The four booster pumps are speed controlled by four ABB general purpose drives, ACS550. They receive a speed reference signal from the ACS355.